Well after my issues with new bee keepers make mistakes. I gave them each a little pancake of Fonda made by rolling out about a kilogram of Fonda between two pieces of wax paper. I figured the wax paper was a good idea it makes it more manageable, its much easier to place it on top of the frames and it keeps the sticky mess from getting all over the frames. But I had no idea they would able to eat though that and about 2 liters of sugar syrup in 5 days. Yesterday after work I went over to the hives and to fill up the feeders. I had checked the day before and found that they where both empty so I went a head and made them some more sugar syrup. I bring it to a boil stirring it constantly. I have read that if you burn it you cant feed it to the bees it changes something and its bad for them. Once the solution starts to boil it turns clear and you know its done. I was unable to lift out the feeder frames because there where still bees in them and I don't think I would be all that popular at home if I brought a bunch of frames in the house with bees. So I filled up a couple of 2 liter soda bottles (After i rinsed out all the coke) with my sugar concoction, and brought that over to the hives to fill up. I thought I would check on the Fonda pancakes while I was there and they where gone. Not just a little gone I mean totally gone. I looked on the grass in fount of the hives and there's wax paper every where. LOL OK I guess they don't want that in there house, wish I could get my teenage daughter to clean up her room like that. After filling up the feeder frames I went into the house to make up some more Fonda pancakes. This time I decided to give them twice as much. The larger of the two hives Heathrow always goes crazy when I give them sugar syrup I don't know why but they where flying all over the place. I really should have taken this as a hint and put on my bee jacket and gloves ......... but no did I do that? of course not! 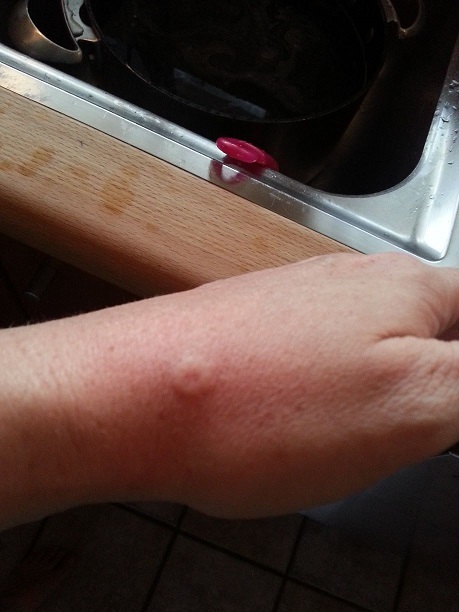 As I lifted up the plastic to lay down there new Fonda pancake a bee fly's up lands on my hand and WAM! Dam that hurt and it was in deep this time. I guess that will teach me! In the house I went leaving the hive open bees flying every where. Put on my Bee Jacket and gloves went back out and sorted them out right. I took the plastic all the way off laid the pancake down nice in the middle bees head butting me all the way. Fixed the blankets I have laying over the plastic to keep things warm. And closed them up. From now on I'm not opening Heathrow for any reason with out having my bee Jacket and gloves on. Probably smoke to they are just way to mean. JFK is fine they don't care one bit when I go in there. Maybe I should try and make a queen from JFK next year and replace Heathrow's, there's another project to consider.